Wagner Solar UK Ltd, the UK branch of German solar power and solar heating supplier, system integrator and manufacturer Wagner & Co Solar Technology, appoints Kamil Shah as UK Marketing Manager. Kamil Shah will be responsible for setting up the marketing department and driving all promotion and communication activities in the UK. 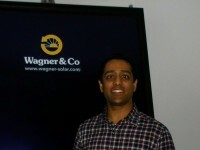 Kamil Shah joins Wagner Solar UK from SANYO, where he was European Corporate Communications Manager. At SANYO, Shah led the company’s solar PR strategy, where he introduced a turn-around from a conservative product led strategy to an open consumer-centric approach.